Join our smuggler as we step back in time and explore Newquay’s dark smuggling and pirate past as we bring to life the stories of the Cornish smugglers, pirates and wreckers. 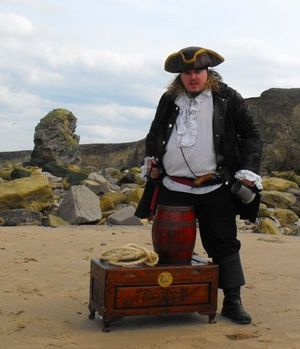 This fantastic tour led by a full costume guide who plays the part of Cruel Coppinger one of the Most evil of all smugglers, wreckers and Pirates and his ship the Black Prince to ever live in North Cornwall. 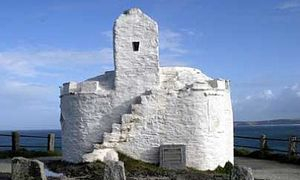 This walking tour discovers these old sites where locals hauled away with horses at the ready to take smuggled contraband inland as far as Jamaica Inn and then on into England, old cottages with found smugglers passageways and untold stories of murder, hear about the Newquay wreckers to pirates that moored in Newquay harbour, learn about Newquay's smuggling caves and the many stories from our coastline. Walk the smugglers path and stand where the old customs and excise men stood and hear about there ghastly ends plus much more on this Newquay smuggling adventure. For ages 6 plus but aimed at adults but fun for all, this tour is not wheelchair accessible due to the sand, steps and coastal paths. We recommend strong sturdy footwear for this mini hike of 0.7 miles in total with regular stops for stories and bringing a beach towel or small blanket so you can sit on the sand or grass during the stories. Leave 2 hours for the tour time and arrive 15 minutes before the tour starts. Tour starts in Newquay Harbour and Concludes on the Headland. Cash payment at the tour start, booking is recommended. Tours run on low tides only, call 07525639943 for daily tours April till September. The act of violence or depredation on the high seas is the legal term of piracy, any crime committed at sea can be classed as a act of piracy and smugglers definitely fall in to this category, this romantic picture painted in today's world of a good old fisherman that the local villages liked, a fool hardly innocent smuggler in his brown breeches and flouncy shirt with tricorn hat and neck tie sneaking barrels of French brandy while the local women hung white laundry sheets to let the smugglers know the coast was clear is far from the truth but at the same time quite accurate. It seams so innocent, whats the harm in some cheap brandy that would cost you 6 times the amount in the UK than it did in France due to extremely high taxes, it all seams so picture perfect that is until you dig a little further in to the watery graves of the many people that would die at the hands of the smuggling trade, villages terrified so much so that they feared the smugglers more than the noose of the law. Smuggling was born out of desperation, the country was in a downward spiral with all of the crowns money going to war and the threat of more wars. The government seen it a good idea to raise the tax on such items like tea, salt, rum, gin, brandy, tobacco to silk and wool, salt would cost 40 times the actual value of the salt. This effected the Cornish, a people of meagre means back then. The only industry really was fishing and they needed the salt to make oils, farming was a hard extremely low paid job. Smugglers carry contraband through a village street in the dead of night, horses hoofs are muffled with rags while locals dare not look upon the smugglers as they fear for there lives! village that may signal that the coast was clear by burning wet gorse bushes to create a smoke plume on a sunny day to the preventy men who were also paid off to turn a blind eye or if they did not they would be killed, just like anyone that did not assist the community in these sinister dealings. In truth villages feared the smugglers, farmers had to lend horses that may be captured or run to death. If they did not the smugglers would use organised crime gangs to threaten them, killing live stock to murder. One of the North coast most evil of all of our smugglers has to go to Cruel Coppinger and the Cruel Gang. Visit Oue Newquay Smugglers Walk Website for More Info!